Cheltenham clerk of the course Simon Claisse does not believe any sort of inspection will need to be passed before racing on Saturday after covers were laid down on Wednesday in order to ensure the bumper Trials Day card beats the weather. Thistlecrack, Un De Sceaux and Unowhatimeanharry are among the stars due to appear at a track where temperatures are set to drop to -4C on Wednesday night into Thursday morning. "We are covering the whole track and the vulnerable areas on the cross-country course," said Claisse. The chase and hurdles tracks were described as good to soft on Wednesday but forecast rain could well ease conditions. Claisse added: "We're looking at 3mm to 5mm overnight Friday into Saturday, but that would be on ground that has been frozen quite a lot over the last ten days, so it wouldn't take much rain to make the ground soft. The covers are completely breathable and porous so that rain would go straight through them." 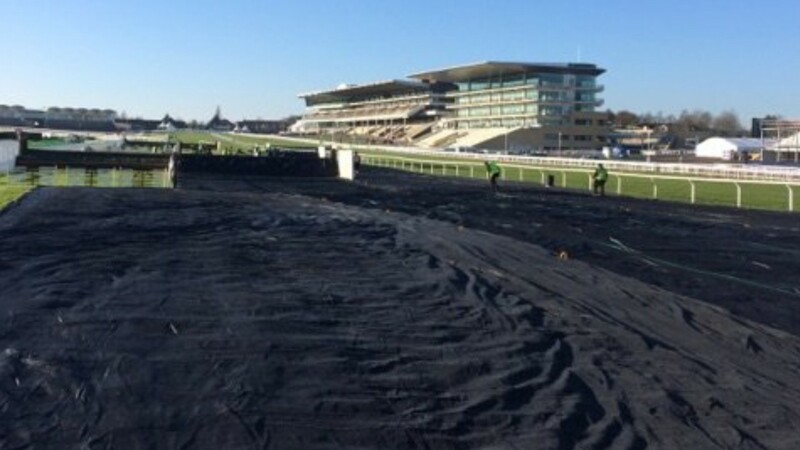 Doncaster, where the going is good, was another track taking the precaution of laying frost covers on Wednesday, although day one of their two-day meeting starting Friday could still be vulnerable. “We’ve covered the entire course,” said clerk of the course Roderick Duncan on Wednesday. “We’ve got a forecast of -2C from tonight all the way through Thursday, when it doesn’t look like daytime temperatures will get above freezing. "There is a 50-50 risk of wintry showers Friday morning and the temperature will be slow to rise. I’ll wait and see what the forecast is tomorrow morning before I decide whether I’m going to call an inspection Friday. Charlie Moore, clerk of the course at Uttoxeter, anticipates the course’s meeting on Saturday going ahead without the need for an inspection, however, one is likely to be needed for Huntingdon's card on Friday. The course was described as good to soft, frozen in places on Wednesday, and clerk of the course Jack Pryor said: "We're 50-50 at the moment and a lot will depend on how cold it gets on Wednesday and Thursday night. An inspection is likely on the morning of racing." Prospects for Friday’s additional meeting at Taunton are more positive, with local forecasts suggesting a frost-free night Thursday into Friday. Hopes for jumps racing in Britain on Thursday hinge on an 8am inspection at Warwick after Fakenham abandoned due to frost on Wednesday. Speaking on Wednesday, Warwick clerk of the course Jane Hedley said: “We're absolutely raceable at the moment but tonight is expected to be very cold, particularly going into tomorrow morning. "With daytime temperatures of 1C tomorrow it's going to be a very raw day and we're concerned about frost so we've called the inspection." Soft. Threat of freezing temperatures. Frost covers are down in vulnerable areas and further fleecing of running lines took place on Wednesday afternoon. Doncaster: Good. Frost covers deployed on whole track. Cold temperatures and risk of wintry shower Friday. Huntingdon: Good to soft, frozen in places. Inspection likely. Cheltenham: Good to soft (hurdle and chase). Good, good to soft in places (cross-country). Whole track and the vulnerable areas on the cross-country course are covered. No problems anticipated. Doncaster: Good. Frost covers deployed on whole track. No anticipated problems. Leopardstown: Good, good to yielding in places on hurdle course.